On duty as nurse in hospital at Memphis, TN January 1864. 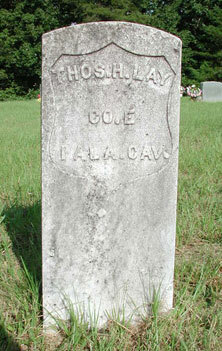 Thomas Lay was born May 2, 1830 in Hamilton Co., TN. He married Rebecca Calvert in 1848 in Walker Co., AL and had the following children: Sarah Ann, 1849; Martha J., 1850; Reuben H., 1855; Mary S., 1859; and Elijah K., 1861. He married second, Jane McKey. Thomas died May 4, 1909.